Jan 17 Friday Spent last night at Mr Orrs. Evelina and her sister-in-law, Sarah Lothrop Ames, stayed overnight in Boston after missing the train to Stoughton. Sarah stayed with someone named H Mitchell (probably not the youngest Ames sister , Harriett Ames Mitchell, who was reportedly in Pittsburgh at this period, but rather a cousin named Harriet Lavinia Angier Mitchell. At this writing, difficult to know for sure.) Evelina, however, stayed with the Orr family. The Orrs and Ameses were friends of many years standing. Like the Ameses, the Orrs originally hailed from Bridgewater, where they, too, had been involved in the making of tools. Old Hugh Orr was a decade or so older than Old Oliver. Hugh’s son, Robert, had moved into Boston with his wife, Melinda Wilbur Orr, of Raynham. Melinda and Evelina were friends, and Evelina usually stayed with the Orrs when she spent the night in Boston. More shopping today, at least for Sarah Ames; Evelina appeared to be shopped out. 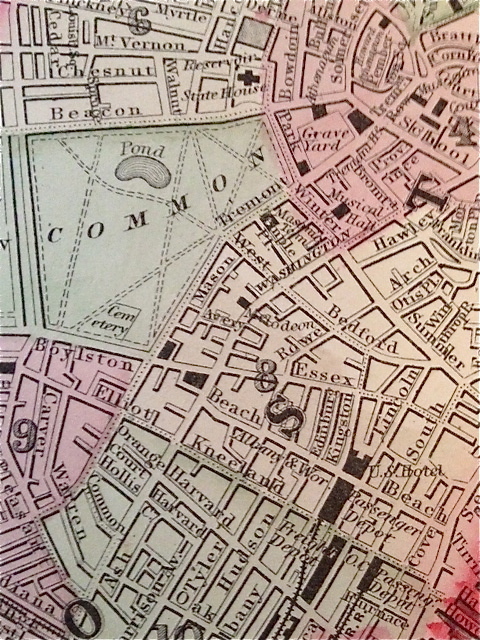 Still, she was happy enough to trudge along Essex and Washington Streets with Sarah (on the map detail, Essex and Washington Streets meet near the “8”, to the right of the Boston Common) dipping in and out of shops. The “beautiful” weather boosted their spirits and more oysters – and turkey – bolstered their stamina. This time, they caught the cars and returned home.